This is where I have decided to put my garden. It's right on the edge of the hill in the front of the house. 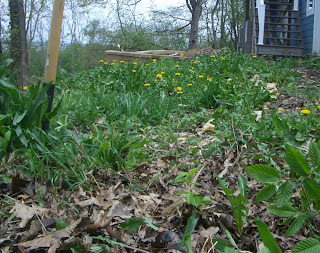 Saturday I dug out most of the weeds and pulled the biggest rocks out of the area. I worked over an hour with what looks like little progress. I think that nothing else shows faith, says, "Here. Forward. ", the way that planting a garden does. The hardest part is just getting started - after that, the growing just happens. you will get it...it just takes some time and patience. the preparation of the area is the key, it is the foundation to success. why do people leave comments as anonymous? if you like something enough to comment on it, then i believe you should have the courtesy to leave your name with your comments.... good luck gardening! Thank you dc nick, (ahem...a former anonymous commenter) for your encouragement. you are welcome....i'm sure the garden is going to turn out fabulous....if it's anything like the rest of your landscaping....and yes i did comment as anonymous previously but thought it to be very impersonal and slightly rude to not identify myself..that is why i now comment with a name. even commenting as anonymous you can leave your name in the comment.i believe you have the right to know who is leaving you comments on your blog. dc nick...thank you for sharing your opinion. However, as the owner of this blog, I have chosen to waive my, as you say, "right to know", by allowing anonymous comments. I noticed that you support your belief in the right to know by eliminating the anonymous option in your comments...H.F.
well said "H.F." i respect your opinion and your rights,as i would hope you do mine....perhaps we will just have to agree to disagree......perhaps over a cup of joe sometime????? ?open offer. I am so happy that you posted before shots! It is so nice to be able to go back and see what it was like before it was fabulous! Thanks for visiting so that I could find you! 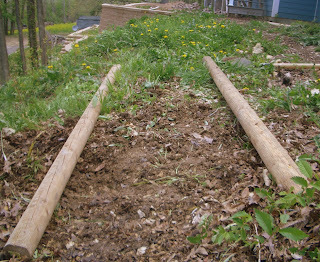 mimi- Yeah, unfortunately I don't always remember the before shot...I usually remember in the middle of the project...as you will see if you follow my (er my husband's) landscaping work in upcoming posts!